This poster was designed, by Donna Kassewitz of the Speakdolphin.com Project in order to inspire people to save the lives of marine animals by cleaning up litter in our water environments. 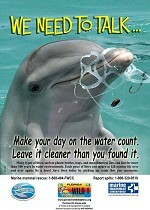 Litter is a serious threat to marine life. Every year countless numbers of dolphins, whales, manatees, sea turtles, sea lions, and sea birds die because of litter entanglement or ingestion. We must reverse the "toss it overboard" or "throw it on the ground" mentality held by many people in our society so that animals do not have to suffer and die needlessly. 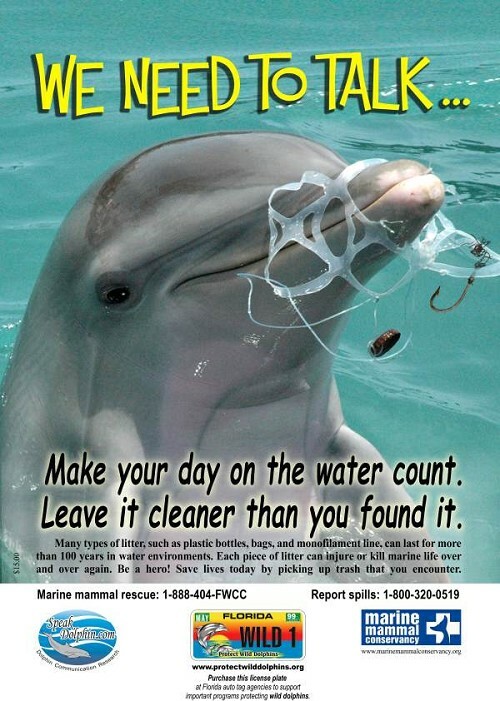 The impact of this poster - a beautiful dolphin's face entangled in deadly trash - is meant to deliver an immediate and obvious message. At SpeakDolphin.com, we often wonder what the dolphins will have to say to humanity, when we are finally able to fully speak with them. Very possibly, the first words out of their mouths will have something to do with cleaning up our mess in the waters of the world! Ideal display locations include: marinas, bait & tackle shops, beaches, lake and riverfront parks. Participating groups will be required to provide us with a list of the public places where these posters are displayed, in order to create a database of display sites. This database will help to determine how thoroughly the posters are distributed within the State of Florida and beyond. Additionally, participating groups will need to commit to taking the posters down in 1 year - so that the posters themselves do not become ocean litter. We plan to have replacement posters each year, so the new posters can be put up at the same time as the faded ones are removed. Participating groups will be able to display their logo on the bottom of the poster - giving them full credit for local distribution. This is a great opportunity for local groups to make a big difference - locally and globally!